Like a growing number of students, Ben Kosinski attended multiple universities over the course of his collegiate career. Although these schools differed wildly in culture and the makeup of their student bodies, the one thing that seems to remain true at any school, he says, is the level of influence online social identities have come to play in the daily life of college students. Yet, in spite of this, the world’s biggest brands still struggle to reach college students — the most coveted demographic — instead, throwing money at the problem through ineffective advertising methods. Seeing the amount of peer-to-peer influence at play on college campuses, Kosinksi saw an opportunity: What if brands could inject their products into that conversation and tap into those student influencers? After graduating from the University of Miami in 2011, Kosinksi decided to address this untapped opportunity, launching Sumpto a year later. 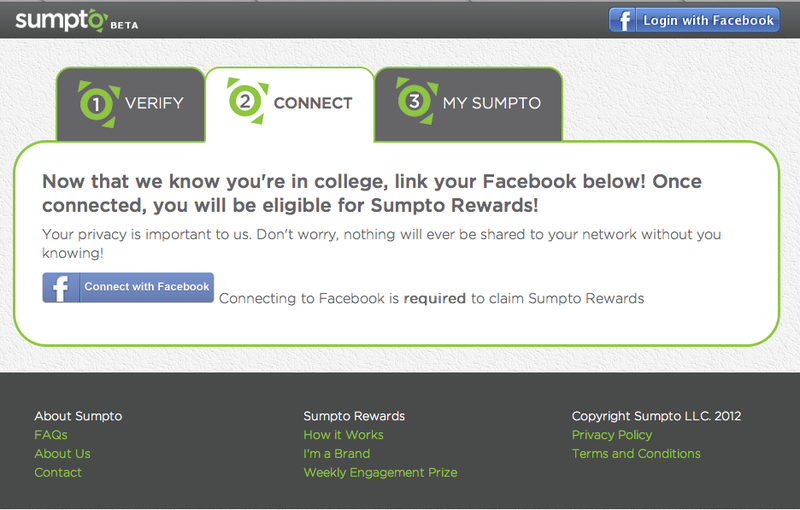 While it doesn’t have the most appealing name, Sumpto’s mission is bound to have some appeal: To become the Klout for college students. Granted, around those who actually know what one is, the words “Klout score” tend to induce a significant amount of eye-rolling. In fact, I’m rolling my eyes as I write this. However, Kosinski assures us that Sumpto isn’t just looking to replicate Klout for the college demographic, although the two companies admittedly share similar goals. Simply put, Sumpto aims to measure the social influence college students have among their peers and reward them for “being themselves,” while in turn allowing brands to sneak their products into the collegiate conversation organically. On Klout, Kosinski continues, people are measured by the same algorithm regardless of whether you’re a 27-year-old engineer, a 35-year-old on Twitter or a 60-year-old blacksmith on LinkedIn. 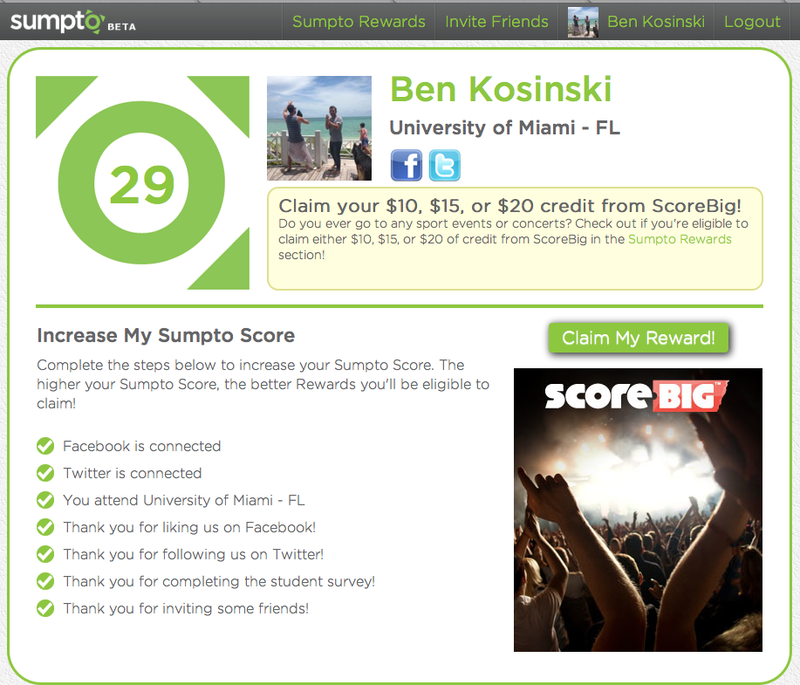 Unlike Klout, Sumpto only allows college students to register and is thus able to incorporate metrics that are unique to college students, like what type of school students attend, their Greek affiliation and the percentage of out-of-state students, for example. That segmentation is built into Sumpto’s algorithms, he says, which in turn gives brands access to more targeted marketing. Furthermore, Klout gives “perks” based on topics of influence, your score and your location, whereas Sumpto offers its influencers rewards based not only on topics of influence, their Sumpto score and location, but private and public school, Greek affiliation, the size of the school, their year in school and in-state versus out of state as well. While the presence of brands in and/or around online conversations and forced interaction is likely far from appealing for college students, Kosinksi says that the platform in no way requires students to say anything about brands if and when they receive rewards. Instead, the idea is to allow conversation to happen around products organically — something that he says college students are likely to do anyway, as they’re being rewarded for something they normally do: Interact with friends and fellow students online. For brands, students represent over $300 billion/year in spending power and over $70 billion/year in discretionary spending. In turn, they also represent the beginning of brand loyalty, the beginning of independent purchasing decisions and tend to be heavily influenced by their peers. (Sorry, college students, it’s true — for myself included.) So the idea, Kosinski says, is to allow students to talk about brands more naturally, which, by definition, has the potential to be far more effective, social (and influential) than the methods traditionally used by brands to target this demographic. Using Sumpto, brands can identify college students who are males at private universities, affiliated with Greek life and have a Sumpto Score above 35, for example. The startup’s algorithm automatically identifies the students who fit those criteria, allowing brands to dole out free products and exclusive access. Sumpto then charges brands for this access. 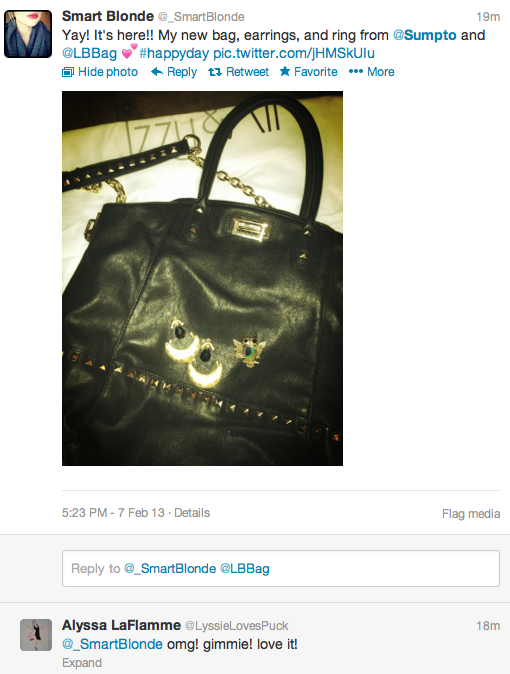 For example, Sumpto just completed an “Influencer Campaign” with LittleBlackBag, in which it generated $1,700 in less than a month by charging the brands a premium to run this targeted campaign. In addition, Sumpto also charges a percentage of revenue generated through its “Rewards Program,” in which varying degrees of discounts are given to students based on their Sumpto Scores. The higher their score, the higher the discount. Sumpto then charges a percentage of revenue generated from the program, which Kosinski says has generated over $30K in revenue for brands and students have claimed over 11,500 rewards to date. So far, Sumpto has worked with four of Klout’s previous clients — like TopFloor, ScoreBig, EBoost and LittleBlackBag — and is currently in conversations with a few more. Since launch, Sumpto has seen 10,000 students register on its platform, a user base which has come purely through organic growth, Kosinski says, thanks to the fact that 81 percent of its users return to the site once a week and 54 percent of its traffic is derived from social referrals. The startup raised $90K from a few angel investors early on, and, based on its continuing growth, has just opened up a $500K seed round to help grow its team and to help it begin spreading the word. Traditional advertising is ignored by college students — as it is by most everyone — so rather than traditional, broad approaches that get little traction, brands need a credible and trustworthy introduction. Sumpto wants to be the one that provides that introduction. So far, college students seem to be buying in, but it remains to be seen whether there’s enough ROI implicit in this model to win over the big brands. The initial pieces are in place, but now comes the hard part: Scale. For more on Sumpto, find it at home here.